Amimon Joint-Source-Channel-Coding (JSCC) technology is used in the majority of all zero latency wireless video camera transmission sets provided by all manufacturers worldwide. In addition to providing chipsets and modules for OEMs, Amimon introduced their own branded wireless video sets called CONNEX for the unmanned market in 2015. 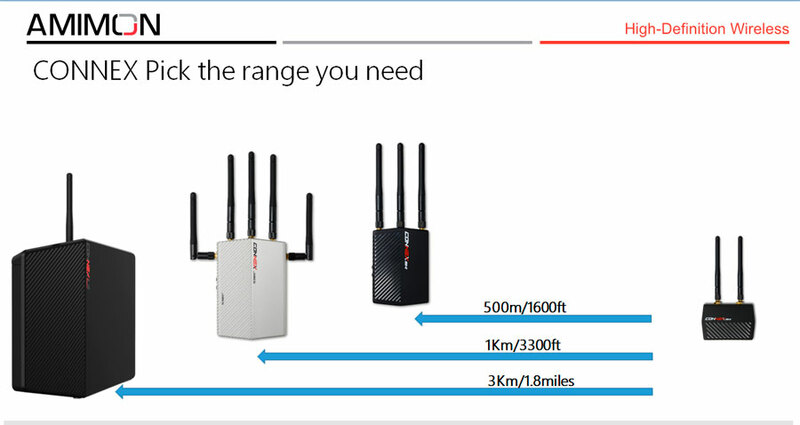 The CONNEX sets were designed to be small, lightweight, and with and very robust wireless connections with a LOS range spec of up to 3300 ft. The CONNEX sets do not transmit audio and have HDMI inputs and outputs. In 2016 Amimon introduced the Conex Mini sets, with even smaller and lighter transmitter, and receiver, supporting also reduced power consumption. 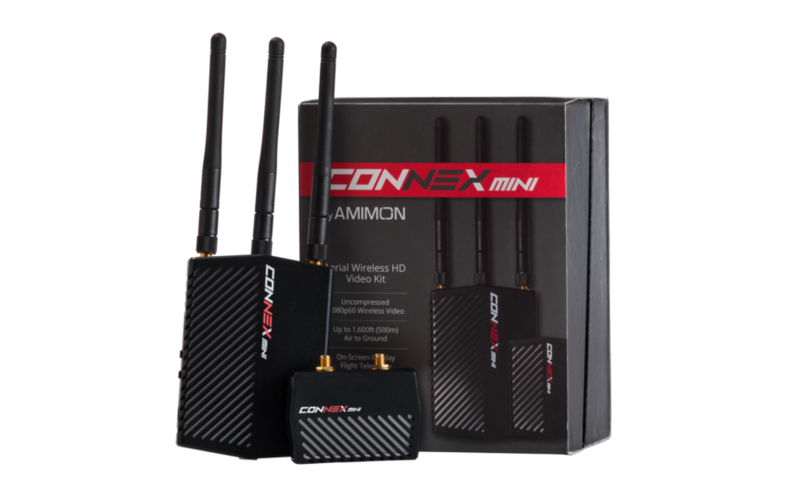 The Connex Mini sets share virtually all of the performance features of the Connex sets, but have a reduced LOS range of 1600 ft.
From 2017, Connex Fusion receivers can work with the Connex Mini transmitter and supports 3300 ft. LOS range. Older CONNEX receivers may be connected to CONNEX mini transmitters by using a free SW update. Also, in 2017 Amimon introduced the Long Range receiver which has 4 internal directional antennas to provide a remarkable LOS range of 10,000 ft. The common range specification for wireless video sets is LOS (line of sight) range. This is the range when there is clear line of sight between the transmitter and receiver with no obstructions between them. LOS specifications may vary from hundreds of feet to many thousands of feet. Production sets or live event environments usually don't require LOS operating distances of thousands of feet. They typically require non-LOS operation over much shorter ranges. So what does a set's LOS range mean in typical environments, and what other factors need to be considered? From our testing with Amimon (and other) sets it is clear that longer LOS specs always result in better non-LOS performance transmitting through crowds, barriers, walls, buildings. etc. But the improvement in performance through various barriers is generally much less than might be expected from the ratios of LOS performance. There simply is no good way to predict non-LOS performance other than live on-site testing, and so LOS performance is the only useful, if less than perfect predictor of non-LOS performance. Other RF sources, and not necessarily just other wireless HD 5GHz sets, can severely limit range for wireless video systems. 5 GHz upper band WIFI activity is becoming an increasing source of interference. An example is a football stadium where a campus wide WIFI system gets hit by many users on tablets or cellphones using the WIFI access. The Connex/Mini sets have the maximum number of channels the FCC allows in order to co-exist with interference and to maintain as much range as possible. A CMR Connex Mini TX and Fusion RX set was tested end zone to end zone during the 2018 Rose Bowl game with no dropouts. Keep receivers as far as possible from other 5 GHz transmitters including WiFi routers. 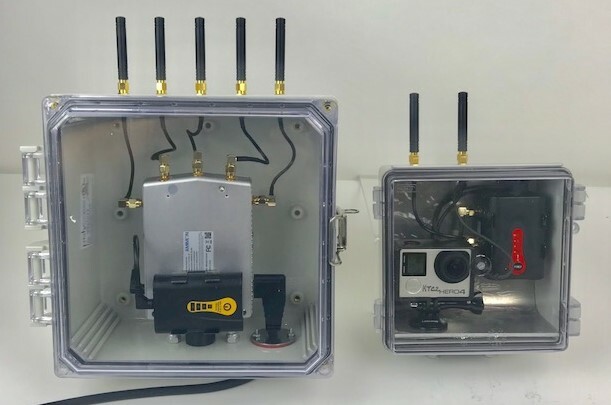 If more than 1 wireless video set is being used, space receivers 3 to 6 feet apart from each other. Use the Amimon Management Application to change the operating mode from 40 MHz channels to 20 MHz channels. This will not change the LOS spec, but it will provide some improvement in non-LOS operation, and with interference. Note that the number of available channels will increase from 12 to 24 to help avoid interference. 20 MHz channel operation can be used for all the normal resolutions and framerates up to 1080I(60). For resolutions and framerates up to 1080P(30) there is no loss of image quality with 20 Mhz operation, but for resolutions above 1080P(30) there is a small but quite noticeable loss of image quality. The Management Application tool is available for PC/Mac download, and also for Android devices. You only need to connect to the transmitter USB port to change operating mode of a set with any number of receivers. 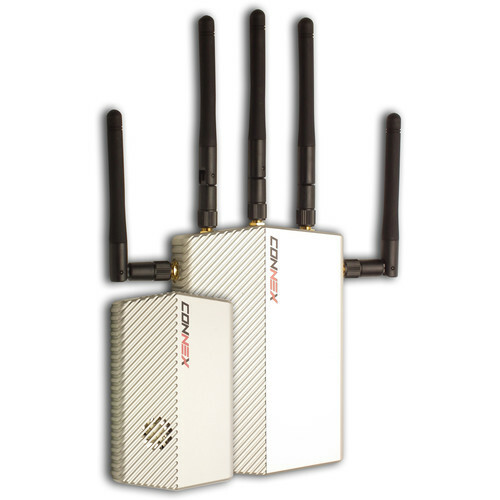 At CMR we were early to recognize the opportunity to provide accessories for the Connex and Connex Mini transmitters and receivers so they could be used like any ground based wireless HD sets. Amimon Connex/Mini sets with CMR accessories are used by cinematographers, video production companies, live event coverage producers, churches and schools in order to take advantage of the lowest cost high performance wireless video sets that meet their needs. CMR has a wide range of camera mounts, cases, batteries, power cables and also flexible HDMI cables to be used with Connex sets which can be ordered separately, or in complete kits. The Connex Mini transmitter is our recommendation for pairing with any receiver. 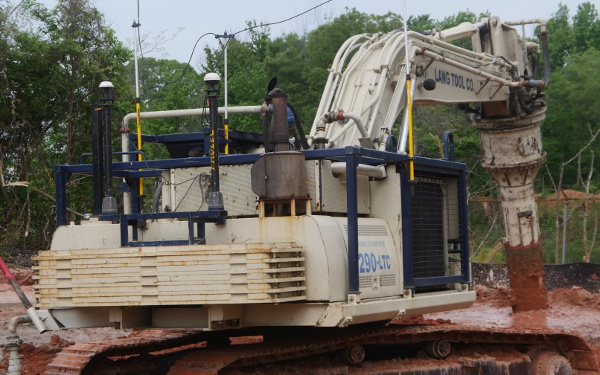 Owners of the original Connex TX and RX sets for unmanned use can increase the utility of their sets by converting them to ground based operation with CMR accessories. The lowest cost system is a combination of the Connex Mini TX and RX set with a LOS range of 1600 ft. They can be ordered with or without batteries, or with D-tap power cables for the TX and RX. This kit meets the requirements of many users who need a robust wireless HD system at the lowest cost. The popular Connex Mini TX and Fusion RX Kit 1 has LOS range of 3300 ft. at a price which is about 1/3 to 1/4 the cost of any comparable range system on the market. It includes batteries for both the TX and RX. And various combinations of CMR accessories are available separately. CMR's latest innovation is the fully enclosed Mini transmitter module, the ACCENT, which provides Lemo power connector, power switch, full size HDMI connector, 1⁄4-20 mounting features, and can be used with or without CMR on-board batteries. And an adapter for the Connex Mini receiver and Fusion receiver has Lemo connector for power option in addition to battery power or AC power. If you have a need for a custom high performance wireless video system, send us an email or call us at (919) 876-6020 to talk about your requirements. We have experience with power supply options, custom antennas and cable selection, bulkhead fittings, converters, and enclosures. CMR engineered a custom Amimon Connex Fusion wireless video system for Lang Tool Co., Beaverton, Mi. 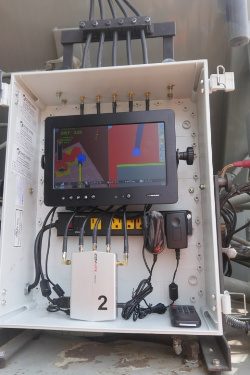 Lang needed to replace their existing wireless system with a longer range and better performing wireless solution to transmit video data from the 'mixer' to the mobile chemical treatment plant. Custom engineered enclosures rated IP66 built for the City of Raleigh Fire Dept.